Scientists have rediscovered a bizarre insect in Kenya, collecting the first Terrible Hairy Fly specimen since 1948. Since then, at least half a dozen expeditions have visited its only known habitat - a rock cleft in an area east of Nairobi - in search of the fly. 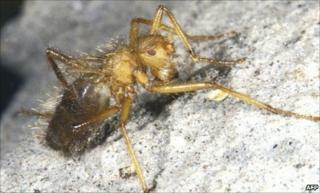 Two insect specialists recently spotted the 1cm-long insect, known as Mormotomyia hirsuta, living on the 20m-high rock. They point out that it looks more like a spider with hairy legs. The fly was found by Dr Robert Copeland and Dr Ashley Kirk-Spriggs during an expedition led by the International Centre of Insect Physiology and Ecology (ICIPE). "The rediscovery of the species, which has been collected on only two occasions before, in 1933 and 1948, has caused excitement in insect museums world-wide," the team members said in a statement. Unable to fly and partial to breeding in bat faeces, the fly is thought to live only in the dank, bat-filled cleft of the isolated rock in Kenya's Ukazi Hills. It also has non-functional wings that resemble miniature belt-straps, and tiny eyes. Dr Copeland of the Nairobi-based ICIPE said the fly's physical appearance had left scientists bamboozled about where exactly it belonged in the entire order of Diptera, or "true flies". "We have collected fresh specimens for molecular analysis to see where exactly the Terrible Hairy Fly fits into the evolutionary process," Robert Copeland told Reuters news agency. "The fly has no obvious adaptations for clinging onto other animals for transfer from one place to another. With its long legs, it could perhaps wrap itself around a bat and get a ride... but it's never been found elsewhere." But he added: "Since Mormotomyia cannot fly, there is a strong possibility that it is really restricted to this tiny habitat."